Employment gap less than high school vs. bachelors degree narrows in 2018. Economists have referred to this phenomenon as "degree inflation," and it has been steadily infiltrating America's job market. Across industries and geographic areas, many other jobs that didn't used to require a diploma - positions like dental hygienists, cargo agents, clerks and claims adjusters - are increasingly requiring one, according to Burning Glass, a company that analyzes job ads from more than 20,000 online sources, including major job boards and small- to midsize-employer sites. 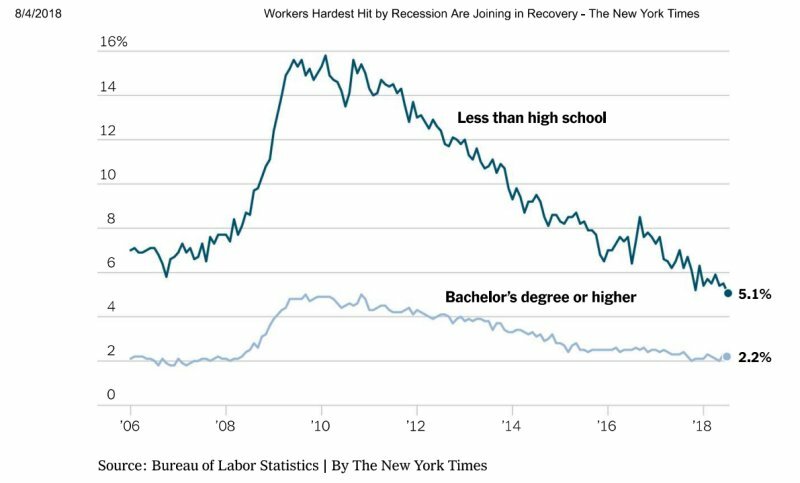 This up-credentialing is pushing the less educated even further down the food chain, and it helps explain why the unemployment rate for workers with no more than a high school diploma is more than twice that for workers with a bachelor's degree: 8.1 percent versus 3.7 percent. This has nothing to do with becoming more technical, but simply a way reduce the number of people even applying for a job, which can often number in the thousands. Those with true usable scientific, technical, and vocational skills don't have this problem. A college degree is no longer a path to a middle class lifestyle it once was, in fact a degree is becoming a joke. But if one can control the cost of their student loans they still have a better chance than those with no degree at all. It's become more related to drive and ambition than simply a piece of paper. The bad jobs reports for March 2013 only makes matters worse. The economy only created 88,000 while we continue to import over 90,000 legal immigrants per month. While many of the immigrants are often low-wage marginal workers, they still out perform many of the lowest achieving demographic groups such as blacks pushing them out of the labor force. Nowhere is this more true than with Asians that are pushing low-achieving blacks and Latinos out of jobs and elite schools alike. Here the anti-white race baiters are at a loss and can't claim racism this time. Or can they? How necessary is college anyway? One estimate is that 1 in 3 college graduates have a job historically performed by those with a high school diploma. According to Richard Vedder, distinguished emeritus professor of economics at Ohio University and the director of the Center for College Affordability and Productivity, in 2012 there were 115,000 janitors, 16,000 parking lot attendants, 83,000 bartenders and about 35,000 taxi drivers with a bachelor's degree.